Josh and Melissa argue about him selling his mice so the school can dissect them, Melissa is against animal research. JOSH: You don't know, it might inspire a kid to become a great surgeon. MELISSA: You don't need to murder a mouse to find that out! Melissa says Josh must change his mind, Josh says he won't and Melissa decides she can't let it happen. Dorothy is talking to Clarrie about his Alcoholic Anonymous (AA) meeting, he tries to get out of it but Dorothy won't let him, she then discovers a chip on one of her statues so Clarrie makes a quick getaway. 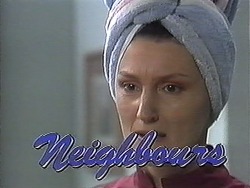 Beverly is talking to Helen, Jim and Des, the mother who she slapped is pressing charges, Beverly goes to lie down and Helen says to Jim must get Beverly to a professional councillor. Harold is giving Eddie tips on his comedy routine! Madge decides there should a rehearsal tomorrow, Eddie thinks it's too soon but Madge insists. CLARRIE: My name is Clarrie and I'm an alcoholic. He says it began while he was a University Lecturer, he says it became worse when his wife developed Alzheimer's Disease, her deterioration made his drinking worse and when she died he started to need alcohol. He finishes and Helen gets up to comfort him. Joe is reading the paper and finds a metal statue that is being sold for $2600, he thinks his will be worth much more than that, Kerry isn't so sure! Melissa knocks on the door, she wants to talk to Kerry about Josh's mice being used for dissection, and she says they might split up, Kerry is appalled. JOE: I dissected a few rats; did you know that if you unravel their intestines that they are three metres long? KERRY: Joe, we are not interested. JOE: Oh, I'll go and polish my sculpture. Melissa wants to stop them, Kerry says there must be a protest but Melissa says that didn't work last time. Kerry decides they need to rally support. 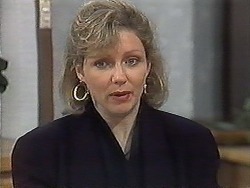 The phone rings and Beverly starts to speak to someone, The Medical Board have asked her to go and see them on Monday, and she might be suspended because of her mental state. Dorothy is off shopping and goes to the emergency fund but nothing is there. 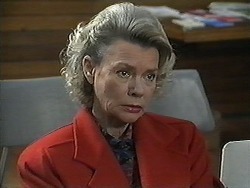 She immediately blames Clarrie who tries to explain about Ryan but ends up storming off. Eddie is having a rehearsal with Des, Paul, Kerry, Sky, Harold and Madge. 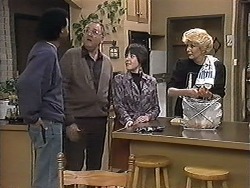 As he makes a joke about Madge's lunch, everyone laughs except Harold. 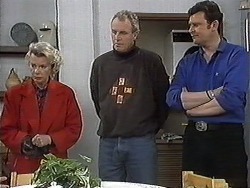 EDDIE: Erinsborough started out as a one horse town, it's not anymore, the horse died…..Dorothy Burke can't be here tonight, she's doing repairs on her broom stick….what about Paul Robinson eh? 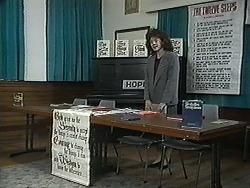 Author of the best seller “How to Bribe a Council Official and get away with it….How's the baby Kerry? Oh no, I've just had a terrible thought, what happens if it looks like Joe?….And Harold, when he was born the Dr took one look at him and slapped his mother! Everyone looks very unimpressed as Eddie moves on. Clarrie is walking down the drive as Helen follows him, he says he is fed up with Dorothy and wants to go to The Waterhole. 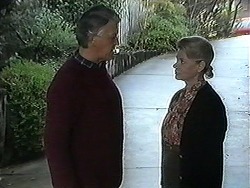 Helen tries to stop him but Clarrie says he's fed up with people telling him what to do. 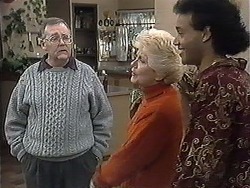 Clarrie shouts at Helen for forcing him to the AA meeting. Eddie has insulted everyone by now, so everyone leaves in their own way except Joe and Madge. 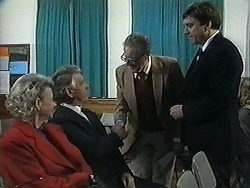 Clarrie is still shouting at Helen, apparently women always interfere, Des and Paul spot the argument as Helen falls over. 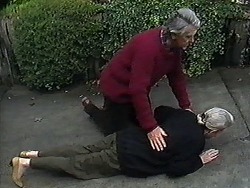 They rush to pick her up; Paul turns on Clarrie and drags him away as Des takes Helen home. Josh is around to as Kerry about Melissa's plan but Kerry won't tell him. She says he is now the enemy which just confuses Josh. Kerry takes Sky to bed while Josh talks to Joe, he says Josh must compromise. 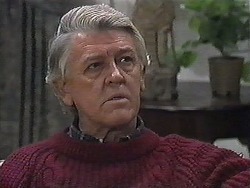 Paul tells Dorothy about Helen's fall, he thinks Clarrie pushed her. 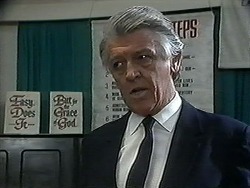 PAUL: No-one hurts my family. 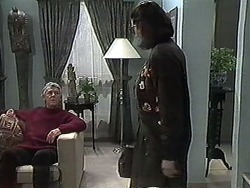 He storms out, Dorothy tells Clarrie to get out who can't quite believe it, he goes anyway. CLARRIE: I'll just forget I had a daughter. DOROTHY: That suits me just fine.